Hi everyone! We stored our garlic in our garage at Clear Sky this winter – which is part of our main building, and around 12-18C, and very dry (its not underground). Most of it has stored really well and is still in great condition, considering it was harvested nearly eight months ago, in late July 2011! 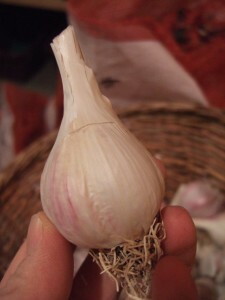 The great news is that we have about 40 one pound bags of garlic left for the season for you! You can pick them up at Max’s Place in Cranbrook BC, or call / email us to get your hands on some organic heritage garlic, mindfully grown at Clear Sky Centre. Its $10/lb.